Electric Car Jack - 12V DC 4000-LB | BUDK.com - Knives & Swords At The Lowest Prices! Changing a tire out the side of the road can be aggravating and a lot of work. 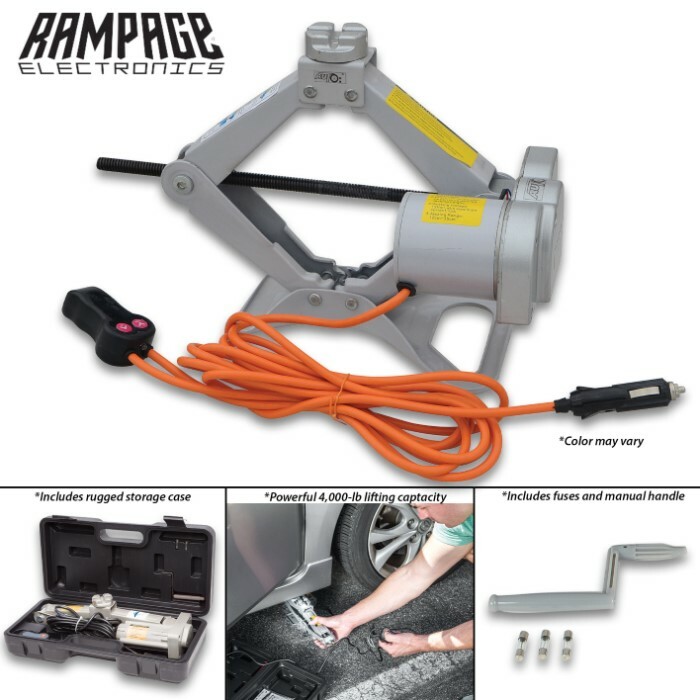 Why not make it easier with the Electric Car Jack, a powerful 4000-lb capacity scissor jack which is powered from your vehicle. The 12-volt cigarette lighter adapter with its 12" cord will reach all areas of the car or truck and a built-in circuit breaker within the jack protects your vehicle’s wiring from over-load. The jack has a heavy-duty 15 amp, permanently-lubricated DC motor and rotating pawl. Since it’s made from premium materials, it will endure years of abuse. The kit also comes with a cord and battery adapter cable with alligator clips. It includes everything needed to get the job done. It comes in a rugged storage case for compact and organized storage.